An evening with Big Norm, Robbo and… Sheridan?! | Through the seasons before us..
An evening with Big Norm, Robbo and… Sheridan?! The Approach is back with an evening of entertainment in November – two of the most highly rated speakers are on show in Mark Crossley and John Robertson (presumably entertaining himself whilst out of work! 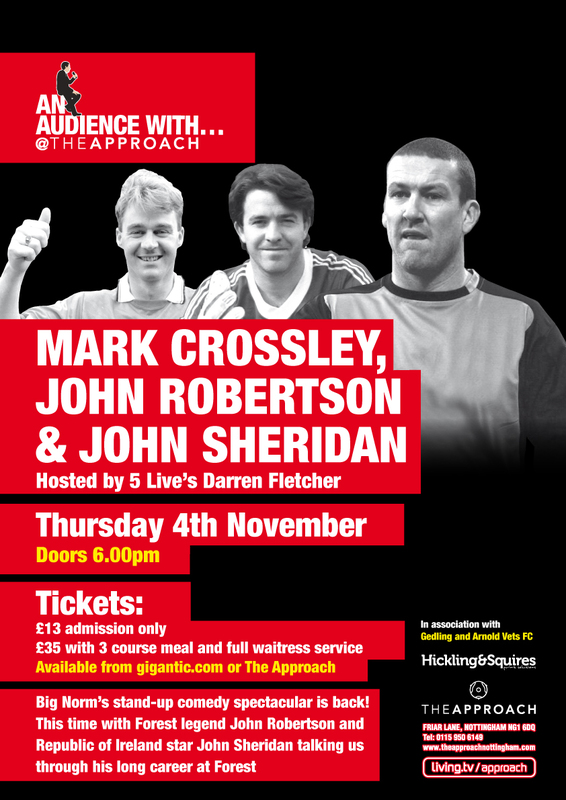 ), and for a bonus the fleeting Reds player John Sheridan is also on the bill to make it a trio of guests for Darren Fletcher to compere on Thursday 4th November. Big Norm has done a couple of nights before and has always been an absolute smash hit with Reds fans, I’ve always seemed to miss out on him so I’m really looking forward to this. He is working on an autobiography due out next year which promises to be a no-holds barred account of his career – warts and all. Robbo is also known to be a bit of a show-stealer on these occasions, and of course he is an undisputed complete-and-utter Forest legend. It will be interesting to see who can win the battle of the entertainer between him and Norm, although I can confidently guess which will have the bigger queue of misty-eyed middle-aged men following them around for autographs (or indeed, who will go for the most cigarette breaks!). As for Sheridan, his time with the Reds may have been brief – but of course, any insight into time under Brian Clough is always readily hoovered up by Reds fans, but perhaps the most story-rich period of his career will be his time playing for the Republic of Ireland under Jack Charlton, not forgetting he is currently manager of Chesterfield. It should be a fun night! You can book tickets online by clicking here, or pop into The Approach and pick yourself up a ticket for just £13. Or for £35 you also get a three course meal with full waitress service. Click the small flyer for a full sized version with all the details you should need! Additional: If you fancy a bargain meal before you head over to The Approach, if you present your ticket to the event at The Cross Keys you can get two Main Meals or Gourmet Burgers for the price of one. It’s decent locally-sourced nosh cooked freshly, so grab yourselves a bargain! The only thing I remember of Sheridan’s days at Forest is a story I was told about Cloughie dragging him accross the training ground by his hair! Ha! Could be an interesting tale! Didn’t Sheridan get bombed out for taking a younger player out on the p*ss shortly after he signed? Wearing cowboy boots?? Maybe I’m getting my stories mixed up! Big Norm, what a man. But I still cant forget the godawful trip to Fratton Park in the cup when he spilled one into the net. Longest journey home ever! As for Robbo, he got a fabulous reception the other night at the CG, I can’t remember the last time a former player got a standing ovation? ?